I have gained a couple of new followers since my last update so here’s a big welcome to my blog; I hope you enjoy reading it. I’ve started off 3 pots each of Oregano, Thyme, Flat Leaf Parsley, and Curled Leaf Parsley. I’ve got some Basil seeds but won’t start them just yet as they won’t tolerate the cold weather. I never bothered with herbs last year and wasn’t going too this year, but having now opened the packets I’ll no doubt start some more off for here at home. Just need to find a narrow container for them to fit in the kitchen windowsill. 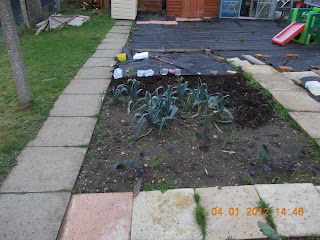 The ground frost finally arrived last week and my veg patch was rock solid. I’m determined to stick to my plan of copying last year’s timing of sowing and the end of this week will see that anniversary arrive. I will start just 3 max of each seed I sow whereas last year I started with 12 pots of Broadbeans and followed them up a week later with another 6! Not this time, I’ve learnt my lesson quickly. One of the first seeds I shall sow will be the Chilli and Bell Pepper ones as they need an extremely long growing season. I will also start a couple of tomatoes off and when I say a couple, it will literally be just 2 seeds of each variety. I will then sow a couple more in 4 weeks time. My seed potatoes arrived last week and have been chitting indoors now but I fear it’s far too warm for them so I’ve placed them down in the greenhouse to further chit in cooler conditions. Upon unpacking them my inexperience showed through in that I couldn’t figure out which end was which and subsequently had half upside down. It was easy to spot after a few days though as the ones that had no sprouts on them were clearly the upside down ones, once upright their little nubbins started poking through. Our mild winter continues apace and signs of spring are showing everywhere. For me, it’s my Rhubarb that’s started poking through. I honestly think we’ve had our winter spell now and shall see temps stay in the high single figures until spring starts proper. There will still be the odd frosty night but the warmth during the day will allow most of my seedlings to slowly grow in the greenhouse instead of every windowsill indoors. The downside to this mildness though is an army of pests will have survived the winter and will group up with this year’s new recruits. My defence needs to briefed! My Brussels Sprouts failed miserably last year and I was determined to get them right this year. My failings were two-fold. Firstly I didn’t heel them in hard enough (easily rectified), secondly, I gave them no protection other than copper collars. To that end I plan to build a Brassica cage from sawn timber and 7mm thick netting. The dimensions shall be 2.4m long by 1.4m tall by 1m deep. This allows 2 rows of plants at 75cm apart (Thanks Pies). I can then lift the cage up when I need to get in to weed. I shall document the build from scratch and post it up here as and when the construction begins. Finally I decided to clean my pots over the weekend. They all look nice and shiny now and are screaming to get used J Momentum is definitely building. Happy 2012 peeps. Hope you all had a great festive break. I managed to steal some time and go through my seed packets and start planning what I am going to grow this year. Those 5 minutes lasted an hour and finished with a banging headache. Once I had finished it was clear it should not have taken that long nor been so traumatic. I was only deciding what to grow!!! Anyway, with that job done I turned my attention to my beds and how I would rotate the crops on them. Again this proved quite distressing so thank god for the good folk online to come to my rescue. Basically, whatever works best for me seemed to be the policy of the day. I was getting worked up over nothing really. Crop rotation should only be a concern if it can easily occur. So I have 5 beds and in 2011 they grew 4 groups of crops (Legumes, Brassicas, Roots, and Alliums). 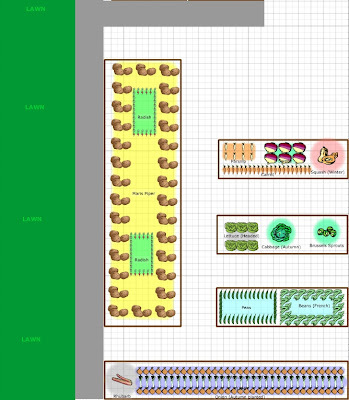 I could use the more common 3 group system but as I have the 5 beds I will start to use the 5 group system which incorporates Potatoes as the 5th group. The old onion bed will be extended and will accommodate the potatoes. This will mean I have mis-matched shape beds but for now it will have to do. I’ve ordered 40 Maris Piper Tubers and should get them delivered some point this month. Upon delivery I will chit them first prior to planting. This will be the first time I grow many potatoes in the ground so am looking forward to seeing how they get on. 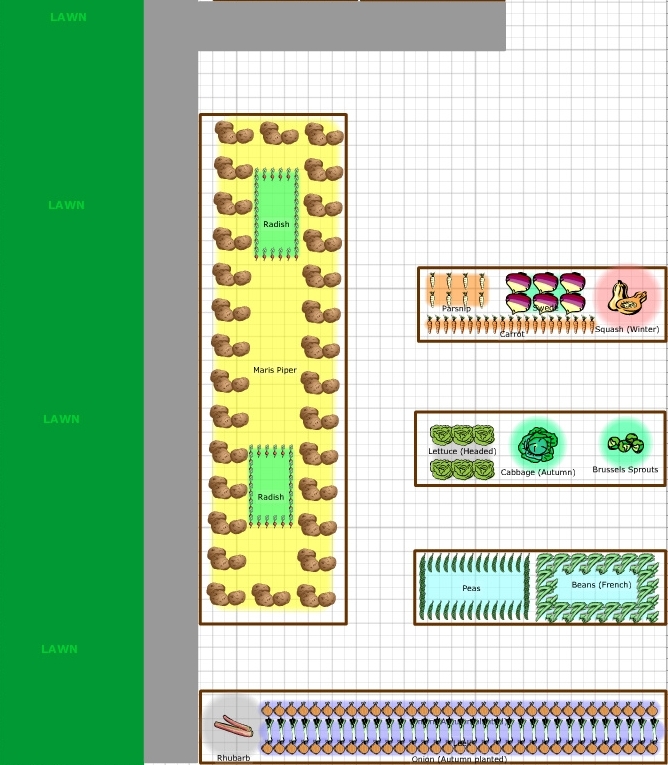 The remaining 4 beds will contain the rest of my grow list below. So most of 2011 will be making a return in 2012. Only this time I’m going to try and improve on the mistakes I made last year. The first being not to sow so many seeds (of the same vegetable) at once and to make a more concise effort to sow successionally so we have a few months of harvest rather than just one major one. I’ll make reference to what didn’t go to plan as and when the time comes. 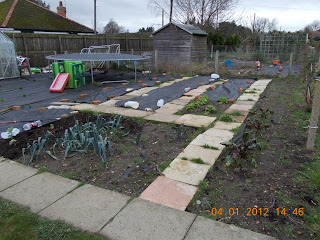 For now though my sights are set firmly on sowing the first seeds of 2012. I’ve decided to start with the Tomatoes and Peppers that will grow in the greenhouse again this year. Last year saw me grow two types of cherry tomatoes and they produced hundreds of fruit lasting all of summer. This year though *I will not be growing cherry tomatoes. Instead I am going to try 3 different varieties. A normal salad tomato (Alicante) and two varieties of plum tomato (San Marzano 3, and Plum Roma). So it’s the middle of winter and the beds are tucked up with a mulch of homemade compost on top and are under weed suppressant membrane. Over the next few days I will be removing the last of the crops, covering with compost, and again, putting them to sleep for two to three months. I will also be extending the bed for the Potatoes mentioned at the top. I shall double the length so it reaches the paving slabs. On the other side of the paving slabs I will be levelling the ground so it’s ready to house my Christmas present. 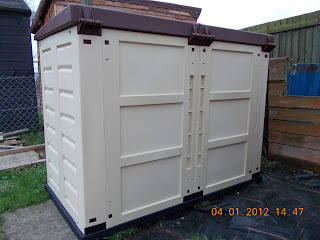 I only wanted a tool shed for my couple of spades and handtools but have been given one big enough to get inside with them! Thanks a lot Mum and Vince. Finally A BIG welcome to my new followers. It is much appreciated and I hope you enjoy reading my progress. Thanks for reading everyone, It will soon be Christmas haha. *At the time of writing this blog last night, I hadn’t received this month’s Grow It magazine. That came today with 5 packets of seeds, Chilli (Anaheim), Cucumber (Marketmore), Tomato (Yellow Stuffer), Tomatillo (Aalsa Verde), and a cherry tomato (Sweet Baby). I may grow one of the Sweet Baby’s. And maybe a Cucumber too! !